We are one of the leading manufacturers & traders of Fire Fighting Equipment and ensure each of them prove their claim to be international quality standard products. We are manufacturer and trader of Fire Exit Sign. Our signage’s available in all safety equipment stores all over India nearby you. The fire safety signage are made of superior quality raw material and placed in various thermal plants, public and private as well as commercial places, The best way is to prepare to respond to an emergency before it happen. An emergency plan cover designated action employers and employee must take to ensure employee safety from fire. 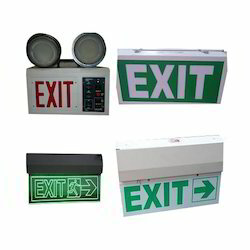 Exit Sign boards the most common safety sign, fire alarm, fire exit, fire extinguisher, emergency exit, fire point, panic bar sign, fire evacuation plan, and assembly point. Fire evacuation Emergency planning is a vital for safe. 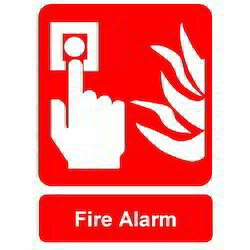 We are offering these Fire Alarm Sign at market competitive prices. The offered safety signs ensure hassle free and convenient evacuation during emergencies. 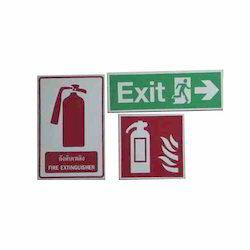 The fire safety signage are made of superior quality raw material and placed in various thermal plants, public and private as well as commercial places. Our products are customized as per the client’s requirement. Our company is a renowned manufacturer and trader of Fire Signs. The products we are offering are manufactured using high grade raw material and we use sophisticated techniques. Further, these products are quality tested by our skilled professionals. 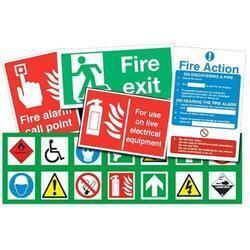 Our products Fire Signs are used in Various places for safety purpose. Moreover, these products can be avail by our clients at reasonable cost as per their requirements. With the constant support of our expert team, we are engaged in offering a huge assortment of Fire Extinguisher Sign. This superior make Fire Extinguisher Sign is highly appreciated for its advanced features and high efficiency. Designed and developed using genuine components, these products are highly demanded in the international markets. We offer this superior quality product as per the needs of our clients. We are manufacturer and trader of Fire Safety Signs, laser lights and exit light Safety from fire is very important while working in harsh industrial atmospheres as it might take the life away. 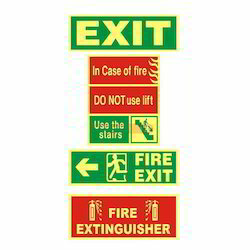 Understanding this prime requirement, our company has also brought forth for its clients one of the finest quality of Fire Safety Signs. Further, we customize them to suit clients’ varied specifications and guidelines.